The Story: Three little boys, Jack, Zak and Caspar, use an old cardboard box to make a castle. Led by King Jack they have a busy day fighting dragons and beasts before going back to their castle for a feast. After Sir Zak and Baby Caspar have gone home King Jack is left to defend the castle. Darkness falls and King Jack starts to get nervous, especially when ‘The Thing’ appears. (I won’t spoil the ending but ‘The Thing’ isn’t as scary as it sounds!). 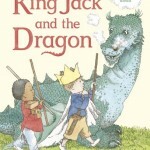 King Jack and the Dragon describes a wonderful game of make believe. The rhyming text flows beautifully and is really easy to read, some pages only have one or two words as the pictures move the story along. Helen Oxenbury’s illustrations are a mix of black and white or muted colour and complement the text perfectly. The dragons and monsters (which come under a lot of scrutiny by my daughter!) are huge in comparison to the young adventurers but the boys are all fearless, including Baby Caspar who has the innocent curiosity of a young toddler. When Jack is alone the fear sets in and the atmosphere becomes charged with anticipation before he too goes home to bed. The first time we read King Jack and the Dragon my daughter wasn’t sure if she wanted me to continue reading and was a little bit scared, especially towards the end. Even now that the story is so familiar she cuddles up close before ‘The Thing’ appears, she still likes to read the story but enjoys the sense of anticipation even though she knows what is going to happen! A wonderful story of make believe that prompted us to play with cardboard boxes! 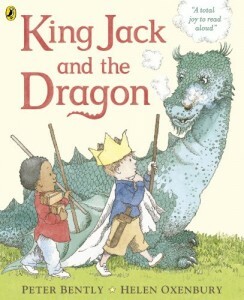 King Jack and the Dragon has also been translated into German. I don’t know what the translation is like but I am intrigued by the differences in the cover pictures – on the English version the boys are ignoring the dragon, on the German version they are riding on it! What will you be reading this Easter? I love this book! Thanks for sharing your review at The Children’s Bookshelf. This book grew on us, my daughter was scared at first but now she enjoys the anticipation of ‘The Thing’! Catherine, I always love reading your reviews. This book looks like one that my kids would love. Helen Oxenbury always has such great illustrations! Story Snug was nominated in The Best Book Review Category in The Annual Bloggers Bash Awards! Story Snug is a participant in the Amazon Services LLC Associates Program, an affiliate advertising program designed to provide a means for sites to earn advertising fees by advertising and linking to storysnug.com. If you click on an Amazon link in a post and buy anything we may receive a small commission at no extra cost to you. Copyright 2012, 2018 Catherine Friess. All rights reserved.